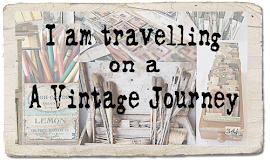 Hi everyone, Nikki here from Addicted to Art to host our latest challenge - Neutral Zone. But before I introduce this month's theme we are excited to be holding a Creative Guide Call! Are you interested in joining our popular challenge blog as a new Creative Guide? We are looking for one or two new people to join the team, to create projects in one of our favourite styles and to share in the hosting of challenges and commenting on entries. We are an extremely friendly group, helpful, supportive and positive in all ways. We have a flexible schedule for completing a minimum requirement of projects and you can choose which months suit you best, you are not expected to join in every one. If you would like to find out more about what you would need to do as a Creative Guide then email Brenda at brenda_brown25@hotmail.com and she will send you more information for you to see whether the commitment is right for you. We're looking forward to expanding the team a little more so as to provide even more flexibility for our wonderfully talented members. Back to our April challenge and it is time to banish colour! We are creating in the Neutral Zone. You can create with blacks, whites, greys, beiges, creams and browns but whatever you make, and whatever style, it needs to stay in the neutral zone. 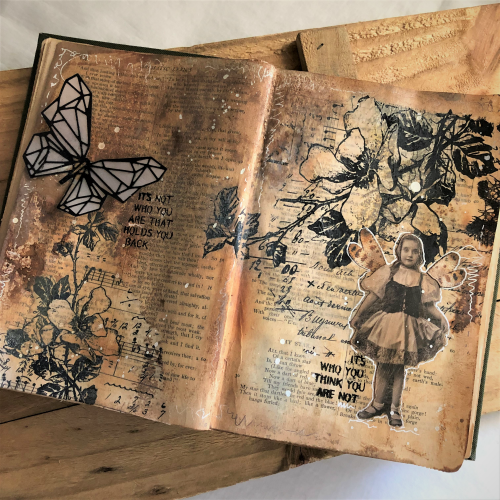 And remember to create in one of our preferred styles of vintage, shabby, mixed media, art journaling, industrial, timeworn or steampunk. Here are our designs which we hope provide a little inspiration to get you started. My 8x8 inch panel is full of varying textures but only black, grey, silver and white. For some close ups and a sneak peak of a second version I made, do head over to my blog. I will be back here in 2 weeks with our project tutorial (April 19th) - with all the details of how I made this. 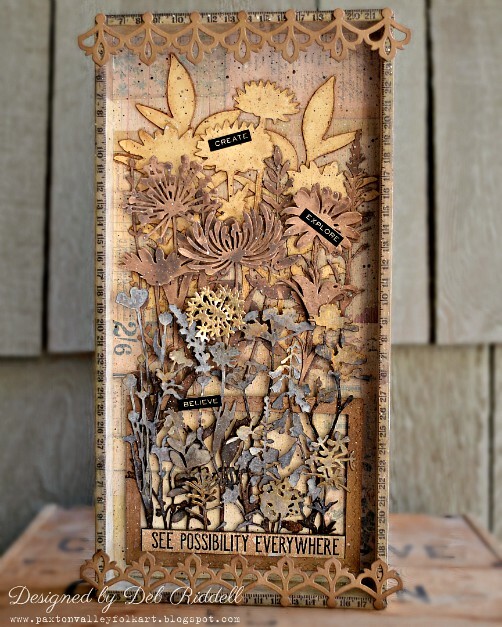 I decided to create a mixed media shadow box for Nikki's 'Neutral Zone' challenge filled with all of the wonderful Tim Holtz Wildflower dies that we now have available to us. Pop on over to my blog to take a stroll through my neutral garden! 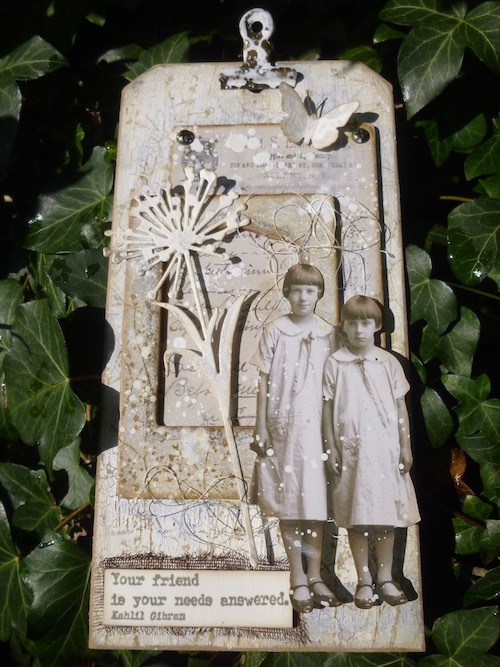 I really gave myself permission to play in my art journal for Nikki's Neutral Zone challenge. 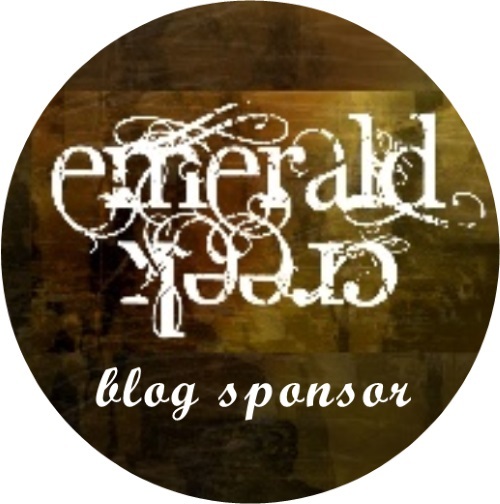 I hope you stop by my blog for the details. I made an eggshaped tag for Nikki's fun challenge seeing this month we will celebrate Easter. I then thought to use the tag to decorate the cover of my latest journal insert. In the last moment I decided to add one of my dried ferns, which of course adds a little spot of colour, but I hope this will still qualify as most of it is definitely in the neutral zone....If you want to see how it all came together, all you need to do is click here. When I hear neutral - my mind automatically goes to brown, yellow and manila. I made a card front for a future card that will go to a family member who is coming to town later in the year. My parents are celebrating their 75th wedding anniversary. You can see more details on my blog here. 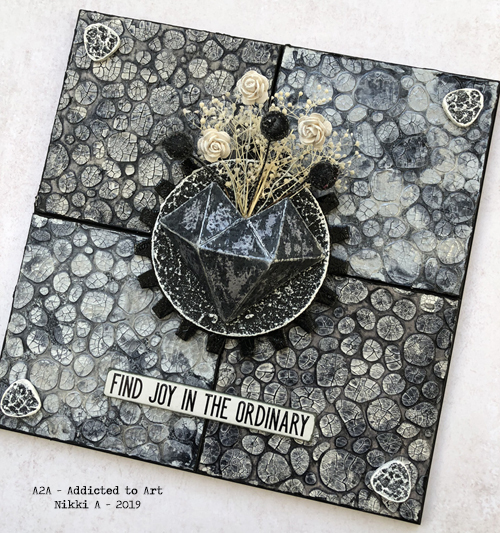 Well, I don't need much persuasion to step into the Neutral Zone... and this made for a lovely return to the craft room after two months away. There were some long-neglected leftover bits and bobs on the table which all just fell into place on this MDF tag. Do come over to Words and Pictures to see all the details. We very much look forward to seeing how you use this neutral palette in your projects! This challenge is open until 2nd May so lots of time to get the thinking hat on and the fingers messy. In the meantime we will be back next week with our Pinworthy winners announcement from the last challenge. Happy crafting everyone. 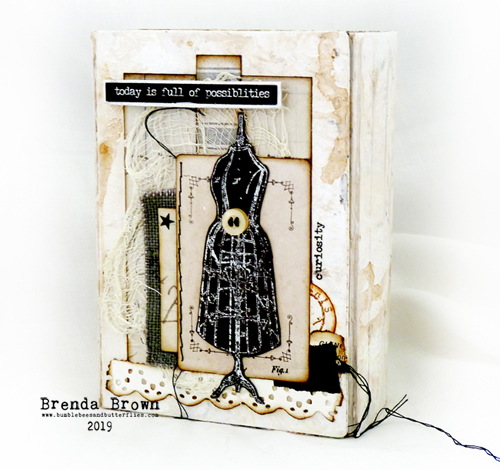 Fabulous 'Neutral Zone' Creativity ladies. Great challenge Nikki and so pleased to be contributin this time :) . Fabulous work from everyone, I really enjoyed doing the rounds just now! Awesome challenge this month!! 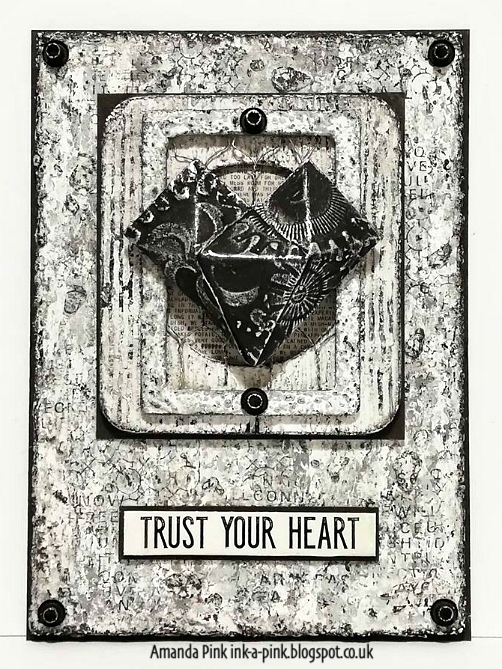 The work from the DT is so inspirational! Thanks! I've had a lovely time hopping round - what beautiful neutral tones in the neutral zone. Looking forward to seeing lots more from the challenge entrants! I've been to visit each and every one of the Creative Guides today - BRAVO LADIES. 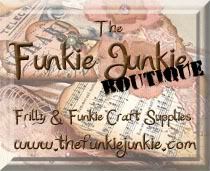 Gorgeous makes from everyone, all very Vintage looking, perfect! Loving the neutral zone. so many delightfully varied and fabulous makes from the team.